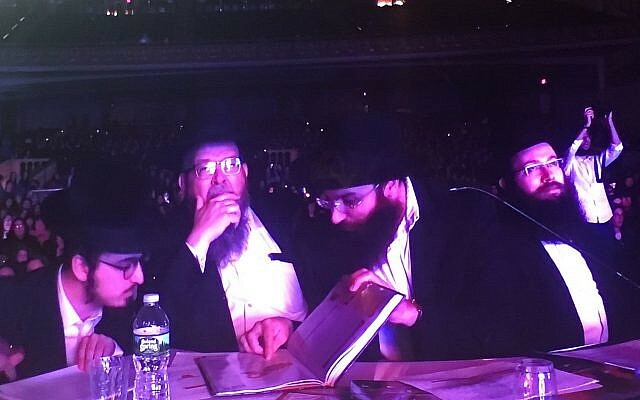 NEW YORK — “What a display of knowledge! 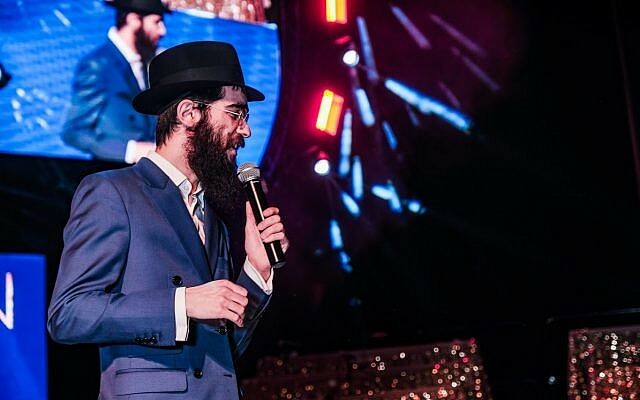 !” a bearded man boasts from the stage. A packed house of mostly Jewish mothers applaud. 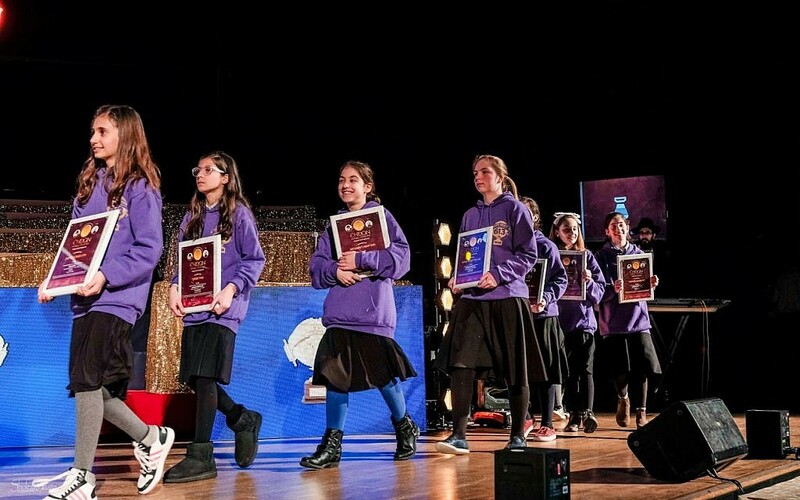 It’s the “kvell and response” part of last week’s show, right before the awards ceremony of the 5779 Chidon Sefer Hamitzvos Girls’ Tournament (loose translation: Mitzvah Quiz), a middle-school game show of (mostly) Chabad-Lubavitch students from all over the world. 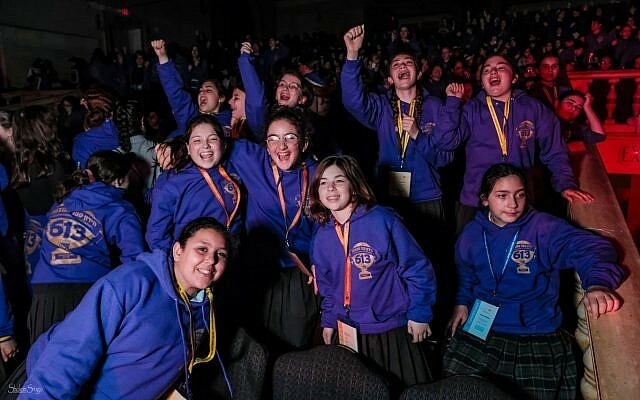 Newark Symphony Hall (ironically enough first called “The Mosque” when the Shriners dedicated the building in 1922) is packed with busloads of brainy Jewish pre- and early-teen girls, some of whom have been studying for a year. A smattering of rabbi judges sit at the lip of the stage, as do a few key benefactors from the business community. The kids are tested on their ability to fire back answers to virtually any question about Maimonides’s 613 mitzvot. The Chidon itself is gender separated, with well over 1,000 finalists. And there certainly will be a record for them to crib from. The Chidon is a big production, with multiple television cameras, even one zooming around on a crane. The set is dressed like a Vegas revue, in bold colors with lots of razzle-dazzle. There are lasers and colored lights and even some dry ice smoke that I’m sure looks great from center orchestra, but as I’m seated way up front to the side it’s starting to make me cough. 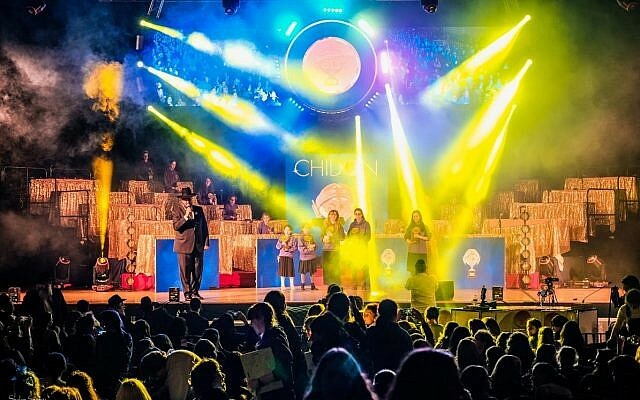 The Chidon is broken up into three acts; it’s more than just “Jeopardy!” for Jews. Representatives from different schools, the highest percentage of which are from the New York/New Jersey area but which also include the West Coast, Australia, South Africa and even Brazil, are broken up into teams, then divided by grade. Round one is for “Rapid Response.” Each child is asked a question (in Hebrew) and they fire back an answer, usually in English. My Hebrew is a little rusty, but emcee Rabbi Yehoshua Lustig asks something and an answer might be “all time!” or “all people!” Points are added up, and team names go on a leader board. The kids in the crowd, some waving glow-sticks, all lose their minds. Sure, they may be there to learn, but they’re also out of the house with their friends in a fancy theater. Pre-teen girls know how to turn anything fun. I can somewhat understand the hesitation. One could make the argument – and with all these Jewish scholars around me, the spirit of argument is strong! – that this may not be so much learning as it is repetition. Someone also translates Tzivos Hashem, the umbrella organization’s name, from Hebrew into English for me. Though just a youth organization, “Army of God” is just extreme-sounding enough in the context of kids to raise an eyebrow. Most of my paranoid fears about thought control are allayed during round two. The “Smart Quest” has sections of each team jot down as many mitzvot as possible on a 60-second clock on a given topic, say, concerning Shabbat. The kids read them out (“Don’t punish on Shabbos!” “Don’t deny death!” “Don’t pity a poor person in court!”) and, at times, the judges confer to see if the phrasing qualifies. The team who gets the most wins the round. At one point there is a commotion. A mistake is made (perhaps one of the five judges interpreted something differently) and eventually it is decided there must be a redo. Some of the girls brighten, some look defeated. One girl pipes up, defiantly: “We don’t have any more paper!” She is given paper. She also takes my heart. Here she is on stage – the same stage where Bob Dylan, Beverly Sills, Leontyne Price, The Temptations, Tony Bennett, The Rolling Stones, Richard Pryor and Queen Latifah all performed — facing down five bearded black-hatted rabbis and saying “Hey, you want me to do a redo? Then I’m going to need some paper!” I check for the Rambam himself to reappear and call her a righteous woman! Part three of the event (after another musical interlude) is called “On The Buzzer,” in which we finally get our more traditional “Jeopardy!” structure. But by now the stage smoke has completely dried out my eyes so I head to the lobby. Scores of girls in matching purple sweatshirts are buzzing around, having a great afternoon. Out in front, in a long marble hallway, a half-dozen theater staff members are chatting about the US presidential candidates. Most are older, all are African-American. One woman opens up a small pre-packaged kosher chocolate babka. Crinkling the cellophane, she seems delighted. An apple-cinnamon mini babka sounds good right about now, so I grab one for a dollar before going in to catch the end.